Today I'm super happy to have been invited to take part of the five year anniversary of A Blog Named Hero. Not only there's a lot of inspiration to be had but a FANTASTIC giveaway with great prizes. I was a part of the ABNH DT something like three years ago and I really enjoyed the time on the team. When I started crafting, something like 9-10 years ago, Hero Arts was one of the first stamp companies I discovered. They just keep making fantastic stamps and products all the time and I don't think I will ever get over my first stamp love. Being a part of the team was super exiting for me. As a bonus I met so many incredible talented crafters that still keeps inspiring me. I also made a lot of great crafty friends, all of them very supportive and caring. It was a great team to be on. I am thrilled getting to not only take part of this second day of the two day long blog hop, but also to hop through it myself and see all the wonderful projects. So let's stop blabbering and get to the good stuff. I made this card using the Flower Garden stamp set. It's not a new set but I love it because of the many things you can do with it. I made a background using distress ink and stamped a floral pattern in gold on top. I used a diecut inlay technique with foil and glitter cardstock for the hear,t and then heat embossed the sentiment in the set on vellum. Your background is so beautiful! I have to try that gold overstamping! What a pretty card, love that background inky goodness. The depth you created in the blue/purple background is really beautiful! 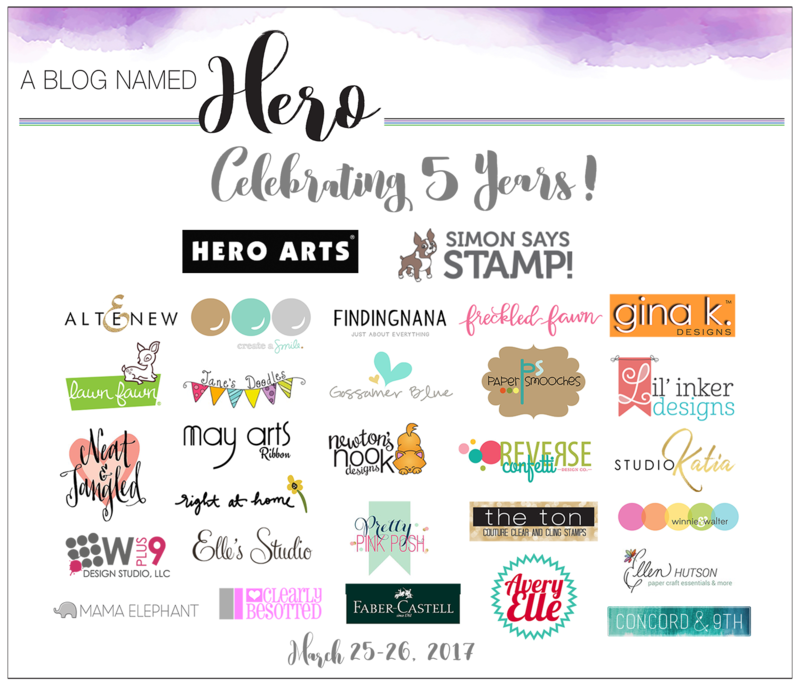 Thank you for participating in the fun blog hop and Happy 5th Anniversary to A Blog Named Hero! Love your background and the gold flowers on it! The gold foil really pops on this card . This card is AMAZING!! I LOVE that striking gold heart in the middle!! Fabulous design! lovely card, Maya - fantastic background!! Love that stunning BG on your pretty card. Wow, what a gorgeous background! Love the gold foiling! This is such a beautiful card! Your background is perfect for the gold heart. I love the ombre background, great job. Beautiful card. Love the gold. Thanks for sharing and the chance to win the give away. Love the card design and the colours you used, very festive! Nice card - Thank you for sharing and Happy 5th Anniversary! Pretty card and cool technique that I will try. That gold looks beautiful against the colors. So beautiful, and I love the look of the distress inked background. Wow this one has a lot going on! So much glitz! Love the background. Lovely card. Your inlay technique and use of gold throughout, is a great idea. Thanks for sharing! The background is so dreamy! Love it. Pretty card- love the background. Pretty! I love the stained glass look! Normally I'm not a big fan of hearts, but I really like your inlaid heart & the gold color is stunning. Wow - that is a gorgeous card! WoW what an amazing background! So pretty! The gold heart is very nice too! Loving this blog hop with all this talent and inspiration! Thanks for sharing yours! Very interesting how many in the blog hop make their own backgrounds. So talented. Not much use of patterned paper. Beautiful card! Great card. Love the inlay work. Thank you for sharing how you made this inlay technique, it makes a very pretty and interesting card. Beautiful! love the stained glass look. Wow, beautiful card, love the ink blending. I love how the rainbow colors blend into each other so smoothly. The fractal heart looks terrific. Thank you for posting such a pretty card. Striking background. Very pretty card. Please tell me you have a tutorial?! Its awesome and i want to learn how you made that card! Beautiful card; thank you for sharing ! Love the background. Beautiful colors. Beautiful job coloring the background! What a fantastic and unusual design - I like it a lot! It says hello I love you. Very pretty. Beautiful card. Love your creativity! What a fun card! I'd love to know how you did the beautiful die-cut inlay on the heart: such a cool look! TFS! Great card ! Happiness always on your 5 year anniversary to a blog called hero ! gorgeous card! I absolutely love it. Love the die cut inlay technique!!!!! I love the beautiful and color rich background! That background is gorgeous! Love all the details! Beautiful, love how you did the background and the heart. Lovely card. The vellum really makes it pop. Beautiful card. Love, love the background. Thanks for the inspiration and participation in this blog. Like all things heart-shaped especially your heart of gold with wonderful background. I love the inlaid technique on your card and the mix of hearts and flowers. Have a great day. Wow, great shine and just a beautiful card all around! Really like the colours of the shading on the background, and the gold touches. You made it look like cut glass, I love the hombre background coloring this was a unique card and I'm glad that you took part in the blog, actually I have enjoyed this entire blog hop - it's one of the best blog hops ever! Congratulations to the lades on 5 years! Beautiful card. I like the way you used so many different techniques on one card. Fantastic colors on this card! This is a very pretty card. Wow! I love that inlay heart, would love to see a video on how to make it. So sparkly and colorful! Love the pretty heart! Great techniques! Beautiful card. I love the die cut inlay technique. What a gorgeous background! I love the sparkle and shine in this card! Beautiful card! Love the background and the glittery heart is so pretty. Great job! I really love this card. Very nice!! Thanks for sharing!! Hearts and flowers are two of my favorite things to put on a card. I especially love your background. Great card! Thank you for sharing. Love the sparkle of your card! So pretty. Love the colors, love the gold heart,heck I love it all! WOW Maya, what a pretty, pretty card! A great job! This is so unique and I love the background and the heart! Awesome! I would love to see how you made the heart. The heart reminds me of stained glass. Very unique card. It definitely has a wow factor. Great job. Very pretty - happy anniversary to ABNH. Your card is beautiful and has so many creative techniques. Thank you for sharing with us. Wow what a CARD! Your background is amazing! Beautiful background!Thank you for the hop! Thank you so much for helping us celebrate at A Blog Named Hero. A very pretty card design! A very stunning card! Love the colors! Love the inlay look! Fantastic background! Absolutely lovely card. I'd be thrilled to receive this card. Love the background. Fantastic colors. Think I can sum this up in one word...WOWZERS! What can a person say, gorgeous background, heart is stunning. Love it. I've never seen a card like that, absolutely beautiful! Nicely done! I will have to check out your others! What a fun, sparkly card! Thank you for the chance to win! Great colors used, very pretty. This is just beautiful!! I love the beautiful colors with all that gold!! Gorgeous card! Love the background colors with the gold! Wonderful talent on such a wonderful blog hop! Very pretty card - the heart is so nice! Love your background on your card. Thank you for all of the good ideas! Who doesn't love an anniversary give away! Yay for ABNH and five years of inspiration! Thanks for your time served in the past on the design team. Your background stamping in gold is really pretty over the distress inks. Beautiful card! Wow. This card is mesmerizing; I could not take my eyes off! TFS. What a beautiful and special card. What a striking card. The colours just 'pop'. Great colouring. Love the colours of the background with the splatters and gold on top. Really pretty with all the gold! Beautiful elements in this card. Especially like the distress ink with gold over. 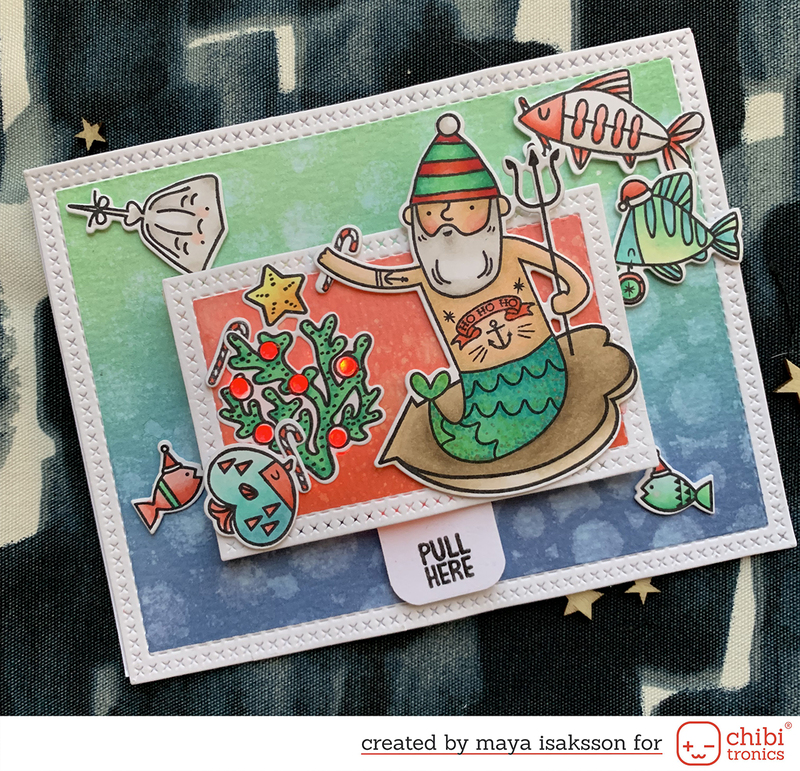 Gorgeous card, Beautiful ink blending!! WOW!! This is such a stunningly beautiful card! Your background is perfect for the gold heart. Beautiful card. I love the colors and perfect for the one you love. I have this stamp set, so it great to see someone use it. Love what you did. Wish you could show us how you did that heart, though! Lovely card. I love that heart and have got to go look up that die. Very pretty. I love the gold. Beautiful card. I went back to find out what die the heart is cut with but it's not listed. Do you remember who it is by? Wow so unique and pretty! What a beautiful background - fabulous colors and I love the gold. Lovely card! That inlay heart is amazing! Thanks for sharing your creativity with us! I like the stained glass effect. Nice card. Love the floral image on the background. Lovely background with a great focal point. Love the in-laid technique. Such a striking card and wonderful background! Love the stamp set and your card is beautiful! Beautiful rainbow background and gorgeous gold flowers! Pretty card. Your background is just beautiful.